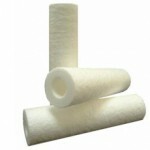 Spun bonded filter cartridges are prepared of 100% polypropylene fibers. The fibers have been cautiously spun together to form a proper gradient density from outer to inner surface. 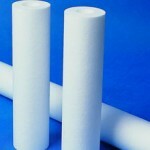 Filter cartridges offered with core & without core version. The better-quality structure remains integral even under harsh operating conditions and is no media migration. Polypropylene fibers are blown incessant on central molded core, without the need for binders, resins or lubricants. Operation Unfiltered fluid passes throughout depth filter matrix, enables the progressive maintenance of finer particles, providing high effectiveness, high dirt retention & filter life. Fluid flows from outside to inside all the way through filter media. Particulates are held strongly in the filter matrix and clean fluid flows out to the downstream side of cartridge. 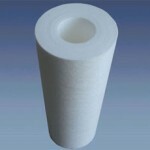 These Cartridge filters are fabricated in such a way that it thermally bonds the pure Polypropylene microfibers with very less density at the outer surface and steadily higher density toward the center. 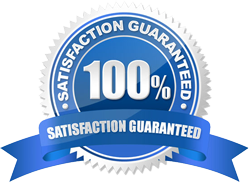 The automated manufacturing process assures stable quality, filter to filter, year in and year out. Spun Bonded Cartridges can be used as both pre-filter or final filter for industrial, chemical process, pharmaceutical, food/beverage, cosmetics, water and other applications. 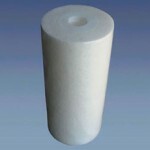 Spun bonded filter cartridge are made of 100% polypropylene.